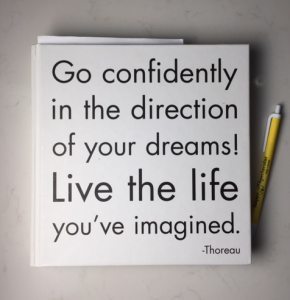 Henry David Thoreau probably didn’t know when he wrote, “Go confidently in the direction of your dreams! Live the life you’ve imagined,” that it would end up on fridge magnets all across America. We don’t do magnets in our house but we do do books, so this is my quote of choice for the journal pictured on the right*. Inspiring message, right? Yet it’s always struck me as incomplete. How can we live our dream lives if we don’t know what our dream lives look like? As a society of worker bees, most of us feel that our work isn’t working, but we’re stuck when it comes to what we actually do about it. We’ve long-since given up on the idea of a job that excites us to wake up in the morning, a job that we giddily carve out time for on the weekend because we actually want to, a job that makes us feel like we’re using our special strengths and talents, a job that lights us up when we talk about it over drinks with friends, a job that energizes us, a job that we feel proud to be doing, a job we’ll feel great that we did when we look back on our highlight reel in the old age home. I want us to want those jobs again. I want us to want for something more. I want us to give ourselves permission to dream about how it could be, how it could feel to have a job that’s so inherently right for you, and how it could then affect the rest of your life because your unhappiness at work does seep into the other areas of your life (kind of like the tuna sandwich that leaks over the rest of the stuff in your lunch box and no one wants a cookie that tastes like tuna). You just say, “I give myself permission.” You get to make decisions on the spot, and this one has just been made. So that was easy. If you’ve read this far it’s because you’re already ready to open that door even just a little crack, so don’t stop now. You don’t announce it to your boss, and maybe you don’t announce it to the people in your life who aren’t super-supportive (because you changing for the better scares them in some way). 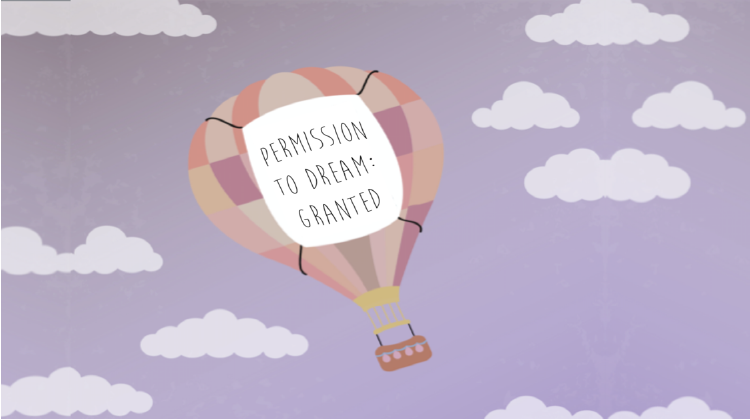 You don’t need their permission to dream. You carve out time to think/ doodle/ write/ research/ do whatever inspires you. I go to hotel lobbies or coffee shops, draw mind maps, and write bullet point lists to get creative and encourage the ideas in my head to come out, like coaxing ketchup out of a bottle. When can you schedule two hours alone? Or maybe 30 minutes every Friday morning before work? Or get up early on Saturdays before the family circus starts? Make one small positive change in your life that’s easy to make, to prove that you can do things that are good for you. Maybe you stop eating fries every time you order a sandwich, or you take the stairs, or you call your Dad, or you floss. Demonstrate to yourself that you’re willing to do nice things for yourself and watch your mindset become a place of possibility. Giving yourself the okay to think about what a dream job might look like doesn’t mean that you need to quit your job by the end of the month. This is a long process and it’s important to take it step-by-step, not all at once (think: marathon not sprint). Acknowledging that there might be something better out there for you – maybe in your current organization, maybe in the same industry but at a different company, maybe doing something slightly different or radically different from what you’re doing now is only the first step. Make the time and space to conceive of what that might be… because even though Thoreau suggested that we “live the lives we’ve imagined”, it’s hard to “go confidently in the direction of our dreams,” if we’re walking directionless with a blindfold on. Lift up one eye and squint at the light. It’s dreamy out there. * Yes, I conveniently posed a Happy Spectacular pen beside the journal in the picture in a shameless act of self-promotion. ** I know, “dream weavers” is immensely corny, but it works, right?